Don't let the long ingredient list on this recipe scare you. You only need to chop a few veggies and measure herbs and spices to have this tasty stew on the table in just over an hour. Let this stew simmer gently on the stovetop, and before you know it you'll have a rich, hearty vegetarian meal. It's filled with heart-healthy lentils, cauliflower, carrots and fresh spinach. The Moroccan spice profile, composed of turmeric, cumin, coriander and cinnamon, is wonderfully fragrant and flavorful, making this a stew that’ll have you crave over and over again. Cauliflower florets will fall apart naturally into smaller pieces as they simmer in the stew. This recipe makes a lot of stew, and freezes well. Freeze in small containers for easy access when you need a quick meal. Make this stew a day ahead if you can, it gets better with time as the complex seasonings have time to develop their flavor. Per Serving: 144 calories; 4g fat; 21.1g carbohydrates; 8g protein; 0mg cholesterol; 783mg sodium. This cauliflower stew is bursting with bold flavors and spices. It's incredibly hearty and filling. I still haven't gotten my kids on board with it yet, but my husband and I love it. 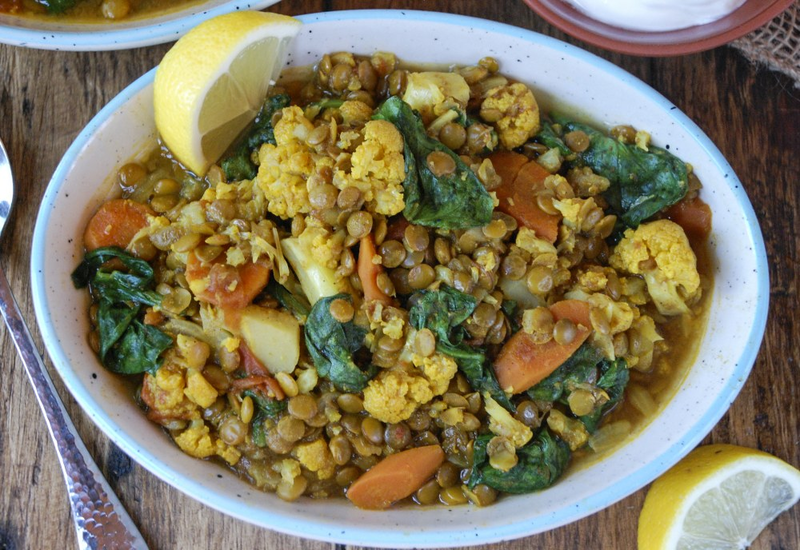 I love lentils and cauliflower, so together in one simple stew is really delicious. This recipe has very authentic flavors like cumin and coriander. The turmeric gives it a great color as well. Very hearty and delicious vegetarian dish.